Wednesdays can be a busy night at my house. I have yoga, Mike has his track workout, and we usually try and get together to eat dinner. This particular Wednesday was even crazier than usual. I left work, ran errands, sprinted to yoga, and stopped by the grocery store on my way home since the rain had prevented me from going earlier in the week. At this point it was getting late and I knew we were both going to want a good dinner that wouldn’t take a long time. 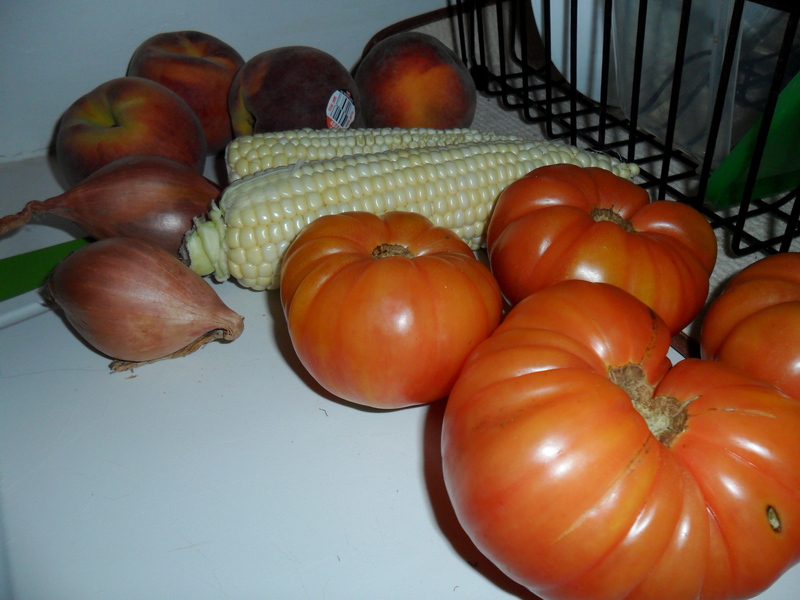 I opted for a fresh and easy summer meal to complement the heat featuring a recipe I had been salivating over since I saw it pop up on Cupcakes and Cashmere. Embarassing confession here… I have never cooked fish at home. I’ve never even ordered something at the fish counter at the grocery store! My mom never cooked it at home growing up so I guess that’s where I picked it up. 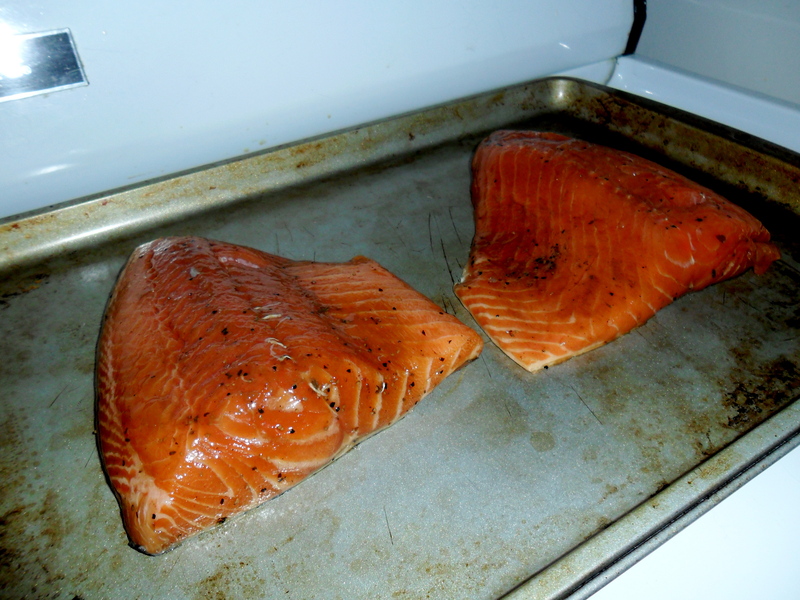 I played it safe for my first time around and purchased two pre-marinated bourbon salmon filets. The filets were HUGE (much bigger than I realized) but I figured I would cook them anyway and just have leftovers. I was a little nervous at first by the fishy smell but once they cooked I didn’t notice it at all (phew… nothing worse than fish smell). I did set off my fire alarm twice while broiling the fish (I swear I didn’t do anything wrong I guess I just have a really sensitive fire alarm!). 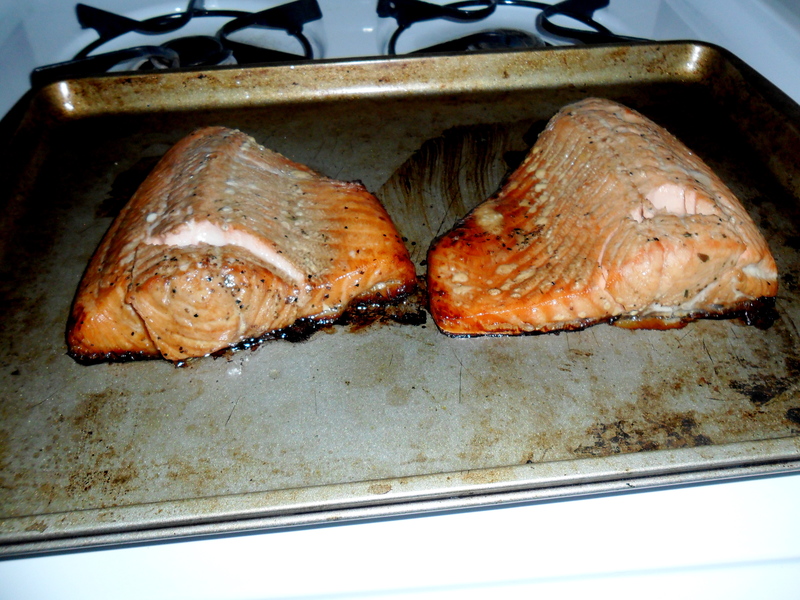 My biggest mistake was cooking the salmon directly on the pan and not putting down tin foil first. This was a big problem. I soaked the pan overnight but I still ended up having to throw it out. Oh well, lesson learned! 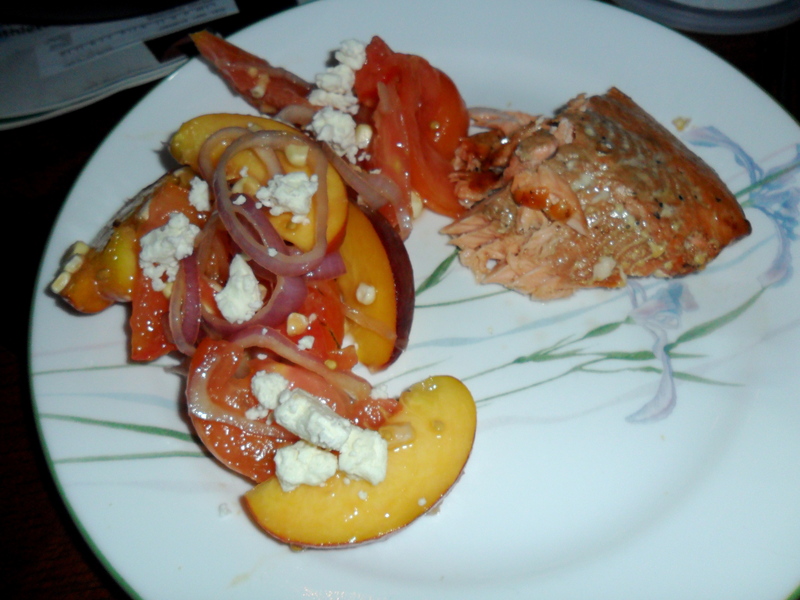 I broiled the salmon for just about 10 – 12 minutes and while the fish was cooking I whipped up this super easy and delicious summer salad. I opted to ditch the bread crumbs because I don’t have a food processor and 1/2 cup of oil felt like a lot. 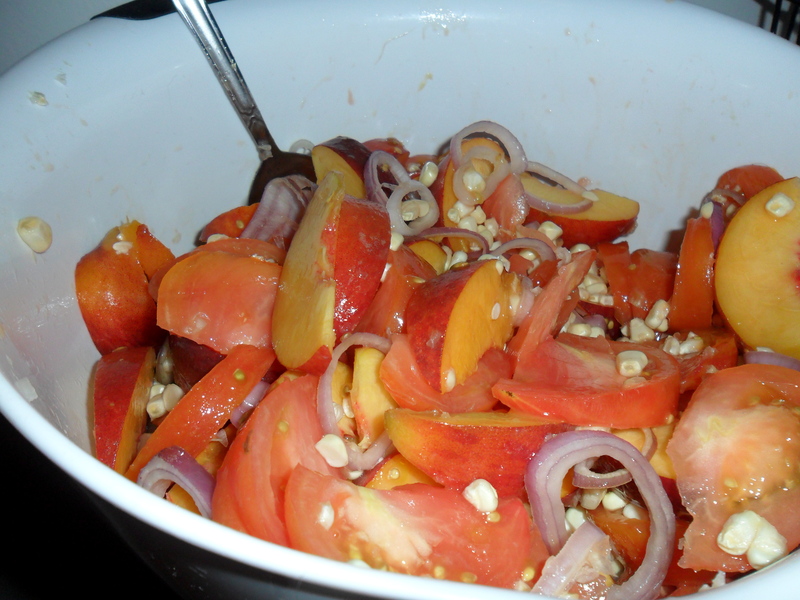 The recipe also called for 6 tablespoons of olive oil to toss the salad but that also felt like a lot for how fragrant and juicy the salad already was. 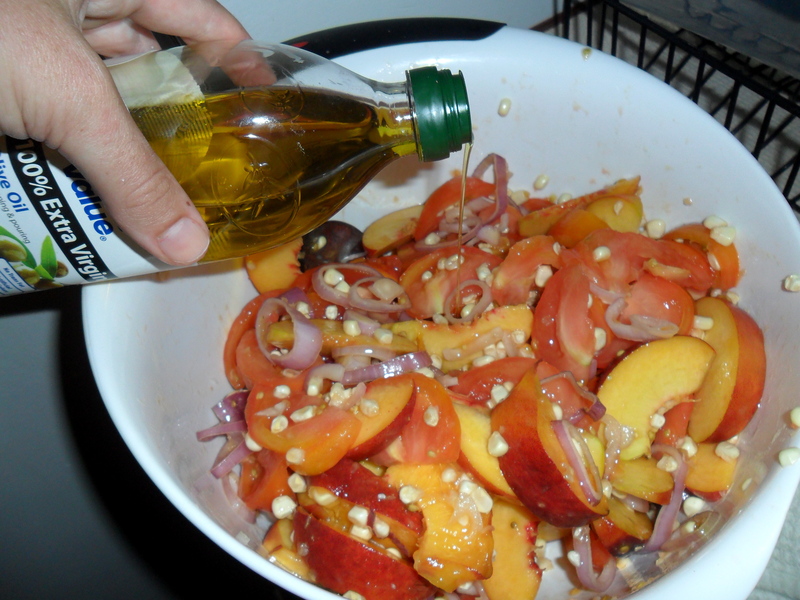 I just went ahead and drizzled a little bit of olive oil to toss (I probably only used about 1 tablespoon total). It was perfection. 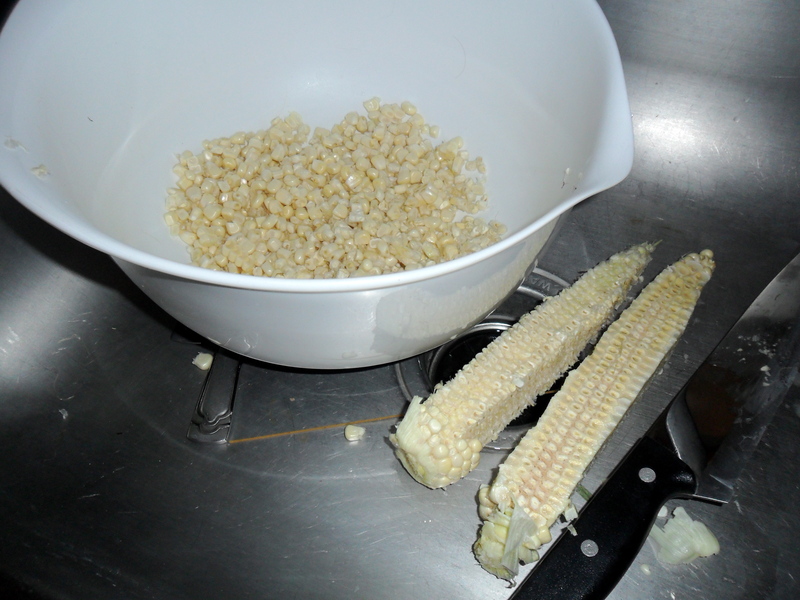 Interesting side note: cutting uncooked corn off the cob is a lot harder than I thought. I started out with it on a cutting board on the counter and literally got corn EVERYWHERE (I even dropped a couple kernels into Fig’s water bowl. He was ok with it though. He fished it out and played with it on the kitchen floor. It’s the little things for cats I guess). Finally, I put the cob right in the bowl and cut it there. The finished product was a truly delicious and super easy dinner. Mike and I split one of the salmon filets and I had two days worth of lunch leftover (Score!). I really had to stop myself from eating the entire bowl of salad (the recipe made 4 servings, I could’ve put that all away EASILY). We sprinkled feta cheese on top of the salad and got into a somewhat in-depth conversation about regular versus fat free feta cheese. I almost accidentally purchased fat free feta and that would’ve been tragic. I’ve used it before and the taste is just awful. I purchase most cheese made with 2% or reduced fat milk but not crumbly cheese. Mike and I agreed that the great thing about cheese like feta or blue cheese is that you only need to use a little bit to get a ton of flavor… why deny ourselves that? ?